078. ROALD AMUNDSEN ZUM SÜDPOL. DER FRAM Issued by J.F. Lehmann's Verlag München. (Date?). Unnumbered card from a set of unknown number. Size: Ca. 2.1" x 1.6" (perforated edge). Recto: Fram tethered to ice with the Barrier in background. 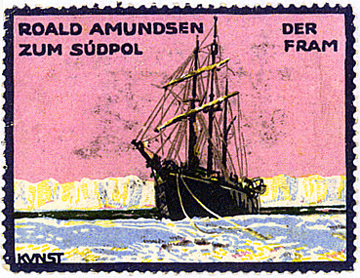 At the top left: ROALD AMUNDSEN | ZUM SÜDPOL. At the bottom left: KUNST.